This week includes a momentous occasion — I am hitting the big 3-0! (PSST I have big giveaways going all week long on Instagram and Facebook so be sure to check it out!) Who doesn't love to celebrate birthdays? And what better way to celebrate than with FREE STUFF! A few years ago I compiled the world's most gigantic list of birthday freebies and have been using it ever since. I revamped it for you below. 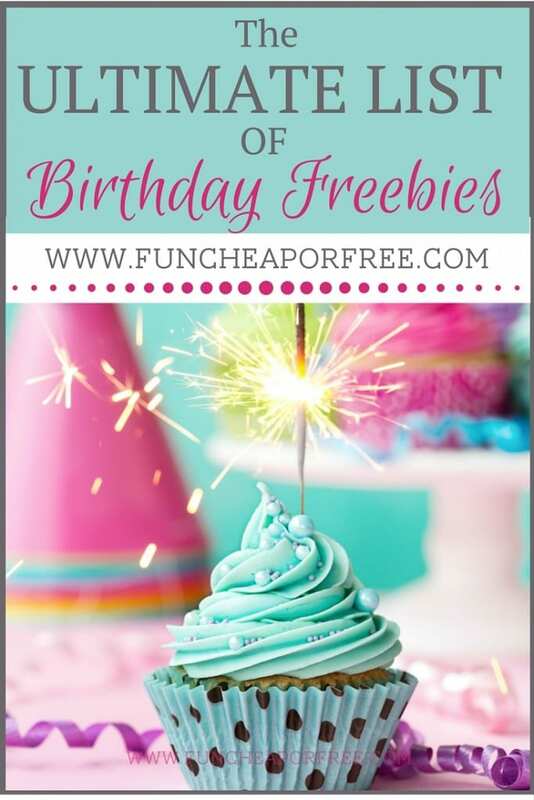 All you need to do is get on the email lists for these places and they will give you great freebies and deals for your birthday and other special occasions. I not only get free food, but free makeup, gifts, coupons, and more! If you don't want junk mail to hit your inbox, simply filter the emails out! That way the coupons and deals are automatically filtered into a handy little folder, ready and waiting for when you need them. Get the tutorial on filtering your email HERE. Just DON'T UNSUBSCRIBE from them, or else you'll have to go back and re-subscribe every year. What a pain! Once you get a deal, put it on your calendar. I use Google Calendar because I can access it from anywhere (my phone, ipad, computer, etc.) and you can have multiple calendars within a calendar. So you could have a “coupons” calendar, and “hide” it when you don't need it. Put the expiration date on your calendar, and put a reminder that the expiration date is coming 1 week before it happens. This is also a great tip for those Groupons and daily deals that always seem to expire before I get around to using them….grrr…. Print out your deals and keep them in your coupon notebook, and leave the notebook in your car. You can read about my old coupon binder HERE, or see my new an improved SUPER easy-peasy way to organize using an accordion file. Abbot’s Frozen Custard – Join the Abbott’s Frozen Custard Fun Club to a get a free frozen custard on your birthday. The site says there will also be freebies throughout the year for their members. Alfy’s Pizza – Get a free mini pizza on your birthday. Abuelo’s Mexican Food Embassy – Get a coupon for a free dinner entree with the purchase of an equally priced entree. Acapulco – You’ll get a 100% free entree plus a free Guacamole right when you sign up. Amato’s Sandwich Shop – Join the Tamatos Club and get a free birthday sandwich. Applebees – Free dessert. They also have a newsletter, but no word if it sends out a birthday coupon or not. Arby’s – Free 12oz. milkshake with any purchase. Austin Grill – Register for their eClub and get a free meal on your birthday. Bakers Square – Sign up for the eClub and get a free pie. Bandido’s – Get $10 off your favorite entree when you celebrate your birthday at Bandido’s in Ohio and Indiana. Barnes & Noble Kids Club – Free Birthday Cupcake! Beef ‘O’ Brady’s – They’ll send you a coupon for a free appetizer. Benihana’s Japanese Restaurant – They’ll send you a $30 gift certificate valid during the month of your birthday. Bennigan’s – Get a buy 1 entree, get 1 entrée free and a free brownie ice cream dessert coupon on your birthday. Black Angus Steakhouse – Receive a complimentary dessert for joining the BA Prime Club and a free steak dinner for your birthday! Bob Evans – Free dessert, free kids meal. Boston’s The Gourmet Pizza – Free birthday surprise. Bonanza Steakhouse – Free steak dinner. Brio Tuscan Grille – To be honest, we’re not sure! But we do know you get something via email. Bruegger’s – Get a free cookie and an e-mail with a goofy looking mascot…also heard you get a free bagel + free birthday surprise. Bruster’s – Free waffle cone when you buy a waffle cone of of equal or greater value. Buca di Beppo – Sign up for their eClub and get a free dessert. Buffalo Wild Wings – You either get a free dessert straight up or with a $5 purchase. Caribou Coffee – They’ll send you a coupon for a free drink on your birthday. Carrabba’s Italian Grill – Free appetizer with entree purchase. Carrows – Free cake plus a free dessert now just for signing up. Cattlemen’s – Join the Cattlemen’s E-Club and get a free dessert when you come in on your birthday. Charlie Brown’s Steakhouse – Sign up and get a free dessert plus points for every dollar spent. Chick-fil-A – Free meal, good for two months! Chili’s – Free dessert if you join their club. Coldstone Creamery – Their birthday club is currently down. Crazy Buffet – Bring a friend and your ID into Crazy Buffet on your birthday and get a free dinner buffet. Culver’s – Free sundae as well as a few printable coupons when you first sign up. Dairy Queen – Free BOGO ice cream coupon via e-mail. Daphne’s Greek Cafe – Free entree on your birthday when you join their ePita club. Del Taco – Get two free soft tacos now and a free premium milkshake on your birthday. Denny’s – Free original Grand Slam breakfast, but only on your birthday! Desparados Mexican Restaraunt – Come in and get a free meal at Desparados on your birthday. Discovery Cruise Line – You get a free one-day cruise from Ft. Lauderdale to the Bahamas. You do have to make the trip with another fare-paying adult and will have to shell out the $20 for the Bahama departure and harbor fee. Dockside Restaurants – Get a free meal on your birthday. Don Pablos – Free $10 gift certificate after joining the Don Pablo Habanero Club. Duke’s ChowderHouse – Get a coupon for a free lunch or dinner entree on your birthday when you sign up on Duke’s website. Dunkin Donuts – Free Coffee! Dutch Bros. Coffee – Stop in on your birthday and get a free coffee as your birthday freebie. El Chicos – I’m told you get a free dessert, but I haven’t been able to confirm this. Fazoli’s – Join their eFamily and get a coupon for a free desert. Firehouse Subs – Sign up and get an email for a free sub. Flat Top Grill – Join their E-mail Club and get a coupon for a free stir fry on your birthday. Friendly’s – Free ice cream cone if you join their birthday club. Fuddruckers – They have a Fudd Club which will w-mail you a coupon for a free 1/3 pound burger. Garozzo’s Ristorante – Bring in your driver’s license to get a free spedini meal at this Kansas City eatery. Glory Days Grill – Free sundae on your birthday if you sign up in advance. Gold Star Chili – Get a free dessert on your birthday, plus a free treat on your anniversary of joining up AND a free appetizer just for joining. Gordon Biersch – They say you get a special “e-gift” on your birthday, which is a Buy One Get One coupon for an entree. Great American Cookies – Free cookie! Grimaldi’s – Sign up for the birthday club at Grimaldi’s and get a free pizza. Hana Japan – Get a free birthday lunch or dinner when you bring in 4 or more people on your birthday. Helzberg Diamonds – Sign up for free email updates at Helzberg Diamonds and receive a coupon for free pearl earrings for your birthday. Hollywood Video – Get a free rental at Hollywood Video on your birthday with card membership. In fact, anyone on your account can get a free rental on their birthday. Hooters – 10 free hot wings. Hooters girls not included. Island's Restaurant – Free Birthday Surprise! Island's Restaurant – Free Kids Jr. Sundae! Jack in the Box – They have a printable coupon for a free dessert valid only on your birthday. Jason's Deli – Free $5 Gift Card! Jersey Mike's – Free Sub + Drink! Joe’s BBQ – Visit Joe’s BBQ (AZ) on your birthday and receive a free meal. Joe’s Crab Shack – Free appetizer with the purchase of an adult entree. Juice It Up – They promise to give you a “birthday gift” but their website doesn’t say what it is. Might be worth signing up for though. Keg Steakhouse and Bar – They’ll give you a 10oz. prime rib dinner with Caesar salad during your birthday month, Sun-Thurs only. You might want to call ahead to confirm this though. Keva Juice – Their Keva Klub sent me a free 24oz regular blend smoothie coupon. Lone Star Steakhouse –Free Appetizer! Lowry Park Zoo – If you’re a Florida resident and go to Lowry Park Zoo (Tampa, FL) on your birthday, you’ll get free admission. Luby’s – Free kid’s birthday meal (ages 9 and younger) on their birthday as a member of the Luby’s birthday club. Macaroni Grill – Come on into Macaroni Grill on your birthday and get a free dessert plus a song. Maggie Moo's –Free Birthday Surprise! Marble Slab Creamery – Kids can join the Marble Slab Kids Club and get a free ice cream cone on their birthday up to age 12. Marie Calenders – Join their eClub and get free offers not only on your birthday, but anniversary as well! McDonald’s – Free Happy Meal for your child on their birthday. This offer is only good at participating McDonald’s in Colorado, Greater Las Vegas Area, Western Nebraska and Wyoming. Medieval Times –Free Feast & Tournament! Memphis BBQ – Coupon good for a free Rack of Ribs & strawberry shortcake, but you must sign up on their website 24 hours in advance. Moe's Southwest Grill –Free Entree! Moe's Southwest Grill –Free Kid’s Birthday Meal! Noodles & Company – Signup for their newsletter and they’ll send a free meal coupon right around your birthday! O’Charley’s – Get $5 off any $20 food purchase. Old Chicago – Free Pizza! Old Spaghetti Factory – Free Kid’s Birthday Meal! Old Spaghetti Warehouse – Join the Warehouse Club and get a coupon for a free meal on your birthday. Olga's Kitchen – Free Kids Birthday Meal! Pancho’s – Join Pancho’s Birthday Club to get $10 off the bill for adults or $5 off the bill for kids. Perkins – Receive an email for a free kid’s meal and birthday greeting on their birthday when you sign them up for the Bakery Buddies Kid’s Birthday Club. Adults can get an email coupon for a free piece of pie. Perkin's –Free Kid’s Birthday Meal! Ponderosa – Free steak dinner. Provino’s – Come on into Provino’s on your birthday and show your ID to get a free pasta speciality dinner (which includes salad, garlic rolls and a birthday dessert!). Qdoba Mexican Grill – Join their eClub and get a free burrito on your birthday, as well as free chips n’ salsa just for joining up. Quizno’s – Join their mailing list and get a free cookie. You’ll also get a coupon for a free Sammie when you sign up. Red Hot & Blue – Free Birthday Surprise! Red Robin – Free Gourmet Burger if you pick up a Red Royalty Card at your local restaurant and then register it online. You also get a dessert when you say it's your birthday in the restaurant! Rita's – Free Birthday Surprise! Rock Bottom – Free appetizer for Mug Club members. Romanos Macaroni Grill – Free slice of chocolate cake. Round Table Pizza – Register with your local restaurant and get a coupon for a free personal pizza. Ru Sans – Visit Ru Sans to sign up for their birthday card to get free food on your birthday. Ryan’s – Join the eClub at Ryan’s and get a coupon for a free adult buffet with the purchase of another adult buffet during the month of your birthday. Sagebrush Steakhouse – E-Club members get a free brownie blast. Schlotzsky’s – Get a free sandwich if you sign up ahead of time. Sephora – Sign up as a Beauty Insider and get a free gift from Sephora on your birthday. Shane’s Rib Shack – Unknown, but we’re promise it’s exclusive! Sheridan's – Free Birthday Surprise! Shoney’s – Get your child (10 and under) a free kid’s meal on their birthday when you sign them up for the the Kids Club. Smoky Bones – Members of the Bones Club get a free meal or appetizer, not sure which. Smoothie King – BOGO coupon for a free 20 oz. smoothie. Sonic – Free regular creamslush, free medium tator tots, or a free medium drink! Also, get a free Wacky Pack Kid’s Meal on children’s birthdays if you register here. Soup Plantation/Sweet Tomatoes – Buy 1, Get 1 Free Coupon! Souper Salad – Join their Souper Salad Club and they’ll e-mail you a coupon for one free birthday meal which can be used within a week or your birthday. Spaghetti Warehouse – Signup for a free meal & possibly free appetizer? Spicy Pickle – One free entree via their pickle club. Starbucks – If you have a giftcard to their store, register it and receive a free coffee on your birthday. If you shop there often, it might be worth simply buying a card for yourself just to get the free coffee! Steak ‘n Shake – Free steak burger with cheese and fries. Taco John’s – Get a free order of Cini-Sopapilla Bites. I’ve never had these before, but if they’re as delicious as they are hard to spell, I’m excited. Taco Time – Taco Time send kids ages 12 or younger a coupon for a free kid’s meal on their next birthday. TCBY – Free small cup of frozen yogurt and $3 off a cake or pie. Texas De Brazil – Sign up for their e-club and they’ll send you a $40 gift certificate! This place can be pricey, but it’s so worth it. Texas Roadhouse – They send a coupon for one free appetizer or sidekick of ribs. The Fox and Hound – Free appetizer just for joining plus free entree on your birthday. The Palm – 3lb lobster, but you must be a member first and follow a few rules. The Melting Pot – Free Birthday Surprise! The Transformation Studio – The Transformation Studio (TX) will give you a free makeover or express facial for your birthday! Be sure to mention the birthday special when you book your makeover or express facial and bring in your ID. Tony Roma’s – Free dessert if you sign up for Romo Rib Expert Club first. Tropical Smoothie Cafe – They’ll e-mail you a coupon for a free smoothie. Tucanos Brazilian Grill – Free Birthday Meal! Waffle House – Join their Regulars Club and get a special coupon. Wendy’s – Free kids meal for the little ones and a free frosty for us adults. Wienerschnitzel – One free corndog. Wingstop – Get 5 free buffalo wings on your birthday. Zaxby’s – Join their Z-Mail club and you’ll get a coupon for a free meal, whether or not it’s your birthday! Kids can sign up here for their Kid Club and get not only a free meal, but a free cookie on their birthday! Zehnder’s of Frankenmuth – Free Birthday Dinner! Zio’s Italian – Come in and get a free dessert on your birthday at Zio’s. Zoes Kitchen – BOGO coupon for one free entree. Z’ Tejas – $15 coupon for the month of your birthday if you register first. American Eagle – Unknown for adults. Children receive an unknown freebie. Barnes & Noble – Children get a free cupcake at their cafe. Children at heart get nothing. Brunswick Bowling – Join the Bonus Zone and get a free game of bowling on your birthday. Chuck E. Cheese’s – Their website promises a birthday special as well, which many people have said is 20 free tokens. Cost Plus World Market – They won’t say what it is, but they promise a “surprise gift” on your birthday. CVS – If you have an Extra Care Card, register it online and get $3 ECB on your birthday. Hot Topic – $10 off coupon on a minimum purchase of $20. Kmart – Children get $5.00 Birthday Bucks, a birthday crown, happy birthday certificate, and birthday Fun Pack with surprise goodies! Old Navy – Join their email club and you’ll get a coupon on your birthday. Proctor & Gamble – They’ll send you a batch of BOGO coupons for various products. The Children’s Place – Register for their Birthday Club and receive 15% off on yours and your child’s birthday + coupons during your birthday week. Toys R Us – Sign up ahead of time and once your child’s birthday rolls around, they’ll get a personalized letter in the mail. Plus, bring your child into any Toys R Us and they’ll get a hat & balloon before having their birthday announced over the loudspeaker. You’ll also get a $3 gift card in mail. Ulta Beauty – Free Birthday Surprise! Walmart PictureMe Studio – Free Birthday Portrait Collage! World Market – Free Birthday Gift! Baltimore Orioles – Free baseball ticket to a non-prime game. Border’s Books – Free Birthday Surprise! Dave & Buster’s – $10 game card credit when you sign up and $5 credit on your bday. Disney Movie Rewards – Get a code via e-mail for 25 Birthday Bonus Points. Harkins Movie Theaters – Present your ID at the box office and get a free medium sized popcorn on you birthday. Medieval Times – Sign up in advance and they’ll send you a free ticket (worth $53!) to one of their feast and tournaments. Missouri Lottery – Free-play ticket. Walt Disney World – Free admission on your birthday when you register in advance and bring the confirmation along with an ID. WHEW! Any I missed? Let me know in the comments below! 30 Things you Probably DIDN’T Know About Me! I turned 30 in less than a month! I am so excited for the next decade! I am hoping by 35 I am in a better financial state than I am currently with 2 young kiddos and a lot of “keeping up with the jones'” I was wondering if you have any suggestion or ideas of how to celebrate turning 30. I always get a pedicure, I just want to do something different without spending a ton!!! Is this list up to date? A lot of the links don’t work and the clubs and freebies can’t be found. This year I got a 55 swag up from Swagbucks, so you get 55 SB back when you redeem a gift card. For Pennsylvania residents : Shady Maple Smorgasbord gives a free all you can eat buffet with ID. It’s in the heart of Amish Country. This is a great list, Jordan! March is a great month – my birthday is this week too! I had no idea that WDW gave free admission on your birthday – that’s awesome! If you sign up for Sephora’s Beauty Insider you’ll get a free birthday gift. Last year it was lipstick. I love the idea of using your calendar to set reminders about time sensitive deals! I’m going to start doing that!! Happy birthday!! I didn’t know that about Walt Disney World. That’s awesome. Our daughters birthday is in October and that would be perfect! 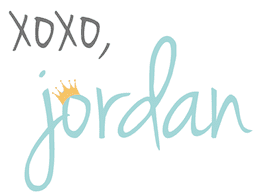 Thanks Jordan!